Posted in Best of Blog, Excuses, Liar, RSI, Writing process. Thank you so much for posting this, Justine. 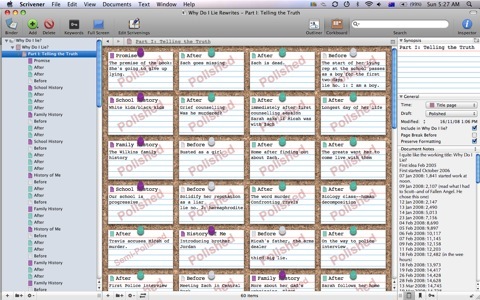 I already write with Scrivener but haven’t yet gotten around to using all the features, so it’s really helpful to see how you used it to structure your novel. Thanks so much, Justine. As someone who’s been playing around with Scrivener for Windows for my novel draft, it’s really helpful to see some of the features laid out like this. I have so much more to explore! I’m not published. Heck, I’m not even finished with the first draft of my first novel. But I do love scrivener! It makes me want to “corkboard” my whole life! I’m getting a Mac soon, and I keep eyeing Scrivener. 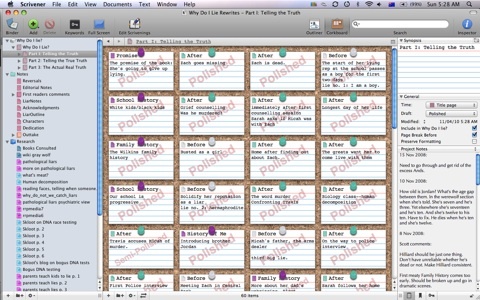 I’m of two minds thought–Scrivener has always struck me as a program best suited for the writer who doesn’t outline. The ability to drag and drop scenes doesn’t excite me overly much, as the basic structure of my novel stays pretty much the same from the rough draft to the final product. Word’s document navigation pane has made it far simpler to jump from one part of a document to another–the one thing about the corkboard that really appeals to me. I’m curious to know if anyone has played with the outlining features of Scrivener, or if anyone knows a plotter who uses it. Thank you Justine. I’ve just imported two novels into Scrivener for revision. I look forward to implementing some of your suggestions. For Nancy above, I generally plot and outline, and write entirely in chronological order, too, but I still find Scrivener very useful. I don’t use the corkboard for plotting at all, but I use the cards for summarizing what happens in each section, which makes it easier to find what I’m looking for as I revise. I also like being able to assign keywords to each section, so I can find everything with one character/one setting/whatever keyword I’ve added and only see those bits. Plus I find the interface a lot cleaner than Word’s and it’s definitely quicker to switch between applications (Scrivener to FF, or whatever, as opposed to Word and FF, which always takes my computer a few seconds). Thank you, Allreb, for the answer. I need to find a Scrivener forum where I can get some of my questions answered… or maybe I’ll just wait until later this fall when the NaNoWriMo forums are active again. woahr thanks for posting – this is fascinating and makes all sorts of sense. I have tried Scrivener but I flub around too much – it’s like a lot of things: I’m sure if I took the time to work out how to use it, it would be perfect for me. At the moment I am lucky enough to have one big wall I can sticky-note to death and that’s definitely helping. This week, anyway. 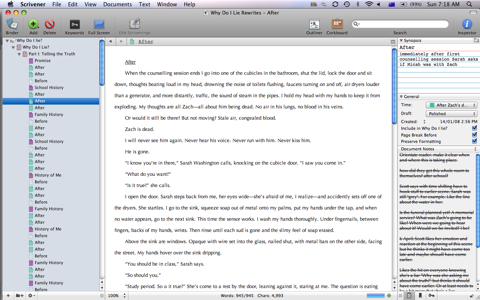 I really like Scrivener also. I’ve been working on a literary novel and find it is easier to create the story. Largely, because I don’t write as linear as some people. I can write scenes when I think of them and easily move content around. It has made the whole process of writing less sterile and of course I love that it doesn’t feel at all like Word or remind me of my day job and all its associated corporate ickiness. I wish I’d had Scrivener when I wrote my book! As it is, I’ve nabbed Scrivener for Windows to use on articles and newsletters (and blog posts and novel drafts and… ), and I’m not looking back at Word! I need to run out and get Scrivener right now. You would not believe the number of things I do manually that it would take care of. I’m talking scissors and sticky notes and millions of trees sacrificed to the writing gods. 2012 is my year of Scrivener, now that I have finally ditched the PC and gone Mac. Thanks for such detailed info.